Yes, Biz and I built a deck! Sorta! Biz recently moved into the ground floor apartment of a rowhouse in Williamsburg, replete with her own fairly sizable backyard. Because she loves to cook and throw parties, her heart landed on the idea of a deck. Unfortunately, her landlord wouldn't subsidize the construction. Building a real deck involves purchasing pressure treated lumber, cutting it to precise size, pouring concrete into the ground, and keeping absolutely everything level and square. (If you're curious, watch this aussie build a deck whilst describing each step in an endearing accent.) We researched the proper methods of deck construction and came to the following conclusions: too expensive, too time-consuming, and a wee bit too permanent for a rental, what with the poured concrete and all. Just when we were feeling discouraged, we both struck upon the same conclusion independently. And both while browsing the free section of Craigs List. Pallets. If you're a perennial troller of Craigs List like me, you know that there are always free pallets up for grabs. Pallets are essentially flatbeds constructed of pressure treated lumber, designed for the shipping industry to be stackable and forklift-able. Their construction is meant to bear as much weight as possible using the cheapest materials and simplest design. Well, hey there. That sounded like exactly what we were looking for in our decking material-- minus all the stacking and forklifting. Protect against weed growth. Lay landscaping fabric under the deck site to prevent weeds from growing through. If you're working with a team, this step also helps to mark the position of the deck. Sand and clean up pallets . We rented a belt sander to supplement by palm sander and gave all the pallets a very thorough sanding. Safety note: I strongly advise you to wear a mask when sanding pallets. Many pallets are treated with chemicals and may have come into contact with all sorts of nasty things during their tenure in the industrial shipping world. We also pried up any loose boards and replaced them with similarly sized boards from our extra pallets. Configure pallets. This is really a game of tetris. 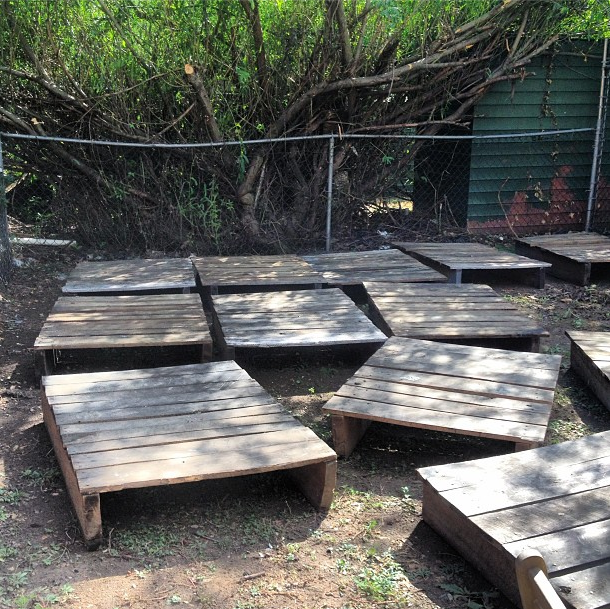 The ground was uneven and although our pallets were fairly uniform in size, there was some variation. We moved pallets around until we got the tightest cleanest fit. We also used bricks to (dug up from the yard) to level out problem areas. Cap front. This step is totally optional. Biz wanted her deck to have more a finished look, so we added two pressure treated boards to the front. This was the only lumber she bought new, so it wasn't a huge expense, but it definitely adds to your bottom line. This wood will also grey over time. Install reed fencing. The chain link fence was in bad shape (also it's kind of scary looking.) 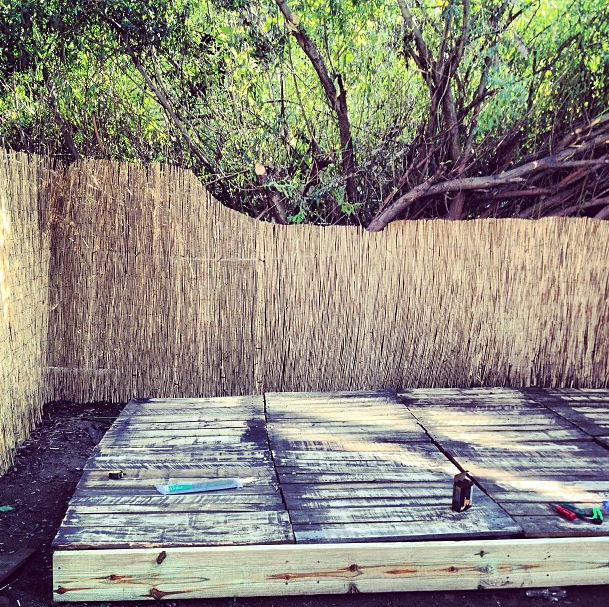 While reed fencing definitely has a tiki hut vibe, it's also extremely affordable and easy to install. We just secured it to the chain link using zip ties. Because the monster tree in your neighbor's yard protrudes over the fence, we had to cut the fencing at the top. It's easy to trim using scissors or pruning shears. Fun, right? All in, the project came to about $200 and took 2.5 days. That's not nothing, but truthfully, the bulk of the cost was in ZipCar rentals for picking up pallets and trips to Home Depot. Renting a belt sander was also a significant expense. If you own your own car and power tools, the project could be done for a whole lot less. I can't wait to style it in the spring for a series on outdoor entertaining! And most importantly, thank you Biz, for including me in your latest DIY adventure.